This paper describes the objectives and the state of implementation of the ROREAS project which aims at developing a socially assistive robot coach for walking and orientation training of stroke patients in the clinical rehabilitation. The robot coach is to autonomously accompany the patients during their exercises practicing their mobility skills. This requires strongly user-centered, polite and attentive social navigation and interaction abilities that can motivate the patients to start, continue, and regularly repeat their self-training. The paper gives an overview of the training scenario and describes the constraints and requirements arising from the scenario and the operational environment. Moreover, it presents the mobile robot ROREAS and gives an overview of the robot’s system architecture and the required human- and situation-aware navigation and interaction skills. Finally, it describes our three-stage approach in conducting function and user tests in the clinical environment: pre-tests with technical staff, followed by function tests with clinical staff and user trials with volunteers from the group of stroke patients, and presents the results of these tests conducted so far. 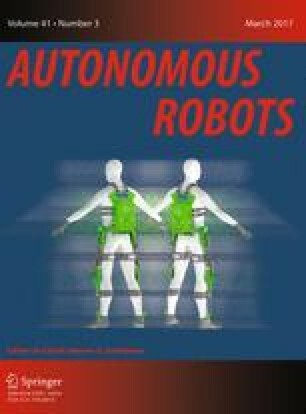 This is one of several papers published in Autonomous Robots comprising the “Special Issue on Assistive and Rehabilitation Robotics”. The authors wish to thank their partners of the ROREAS research consortium for their trustful cooperation allowing them to do robotics and HRI research in a challenging real-world scenario and environment, the “m&i Fachklinik” Rehabilitation Center Bad Liebenstein, the SIBIS Institute for Social Research in Berlin, and the health insurance fund Barmer GEK Wuppertal. This work has received funding from the German Federal Ministry of Education and Research to the project ROREAS (Grant Agreement No. 16SV6133). Informed consent was obtained from all patients for being included in the study. Additional informed consent was obtained from all patients for which identifying information is included in this article. Basteris, A., Nijenhuis, S., Stienen, A., Buurke, J., Prange, G., & Amirabdollahian, F. (2014). Training modalities in robot-mediated upper limb rehabilitation in stroke: A framework for classification based on a systematic review. Journal of NeuroEngineering and Rehabilitation, 11(111), doi: 10.1186/1743-0003-11-111. EU-Robotics (2015). Robotics 2020 multi-annual roadmap for robotics in Europe-Horizon 2020. http://www.eu-robotics.net.